Although I don’t wear jewelry on an everyday basis, adding some pretty jewelry pieces always makes any look complete. Over the last couple of years, I’ve learned to stop buying as much cheap jewelry as I used to and invest a little bit more in high-quality pieces. Two of my favorite brands when it comes to jewelry are definitely Pandora and Alex & Ani. If you guys didn’t know already, my mom actually works at Pandora, so that’s where my Pandora addiction comes from. However, Alex & Ani is a brand I discovered only about a year ago and I have accumulated a beautiful collection since then. Back when I lived in Toronto, there was actually an Alex & Ani store quite close to my apartment, which was super convenient! Now that I’m back in Belgium, getting my hands on Alex & Ani is a bit trickier. Luckily, my friend from back in Toronto visited me about a month ago and brought these beautiful new bracelets with her all the way from Canada. 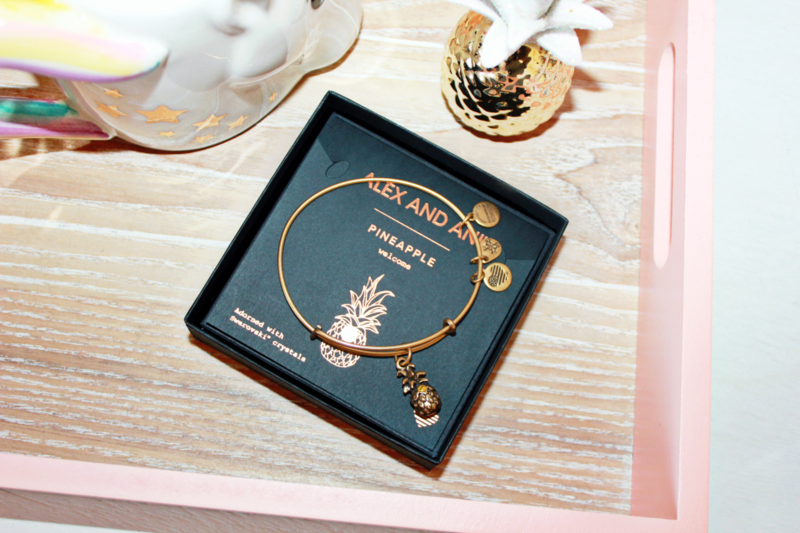 I ordered a unicorn bangle and she actually surprised me with the pineapple bangle for my birthday, which was so special and sweet of her! I think it’s safe to say I’m pretty obsessed with unicorns, if you couldn’t tell already. 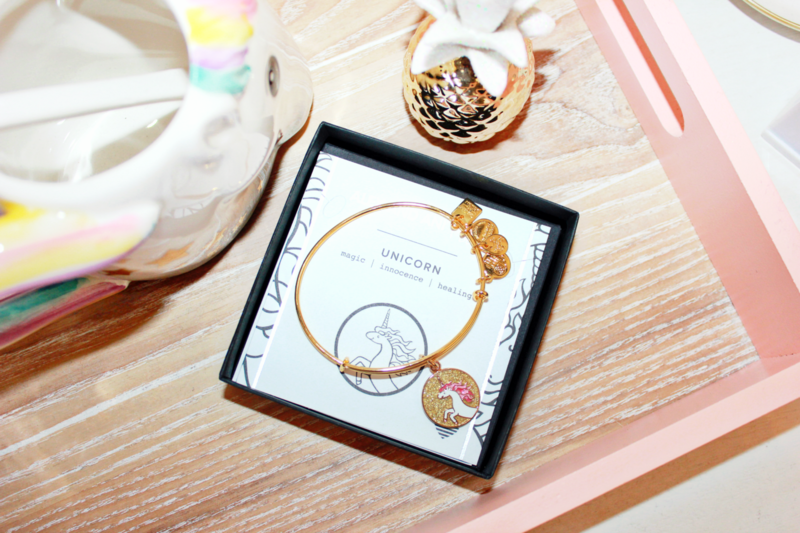 When I saw that they released a magical unicorn charm that has pink accents and glittery details, I had to get my hands on it somehow. Doesn’t it look whimsical?? And the best feature about it? 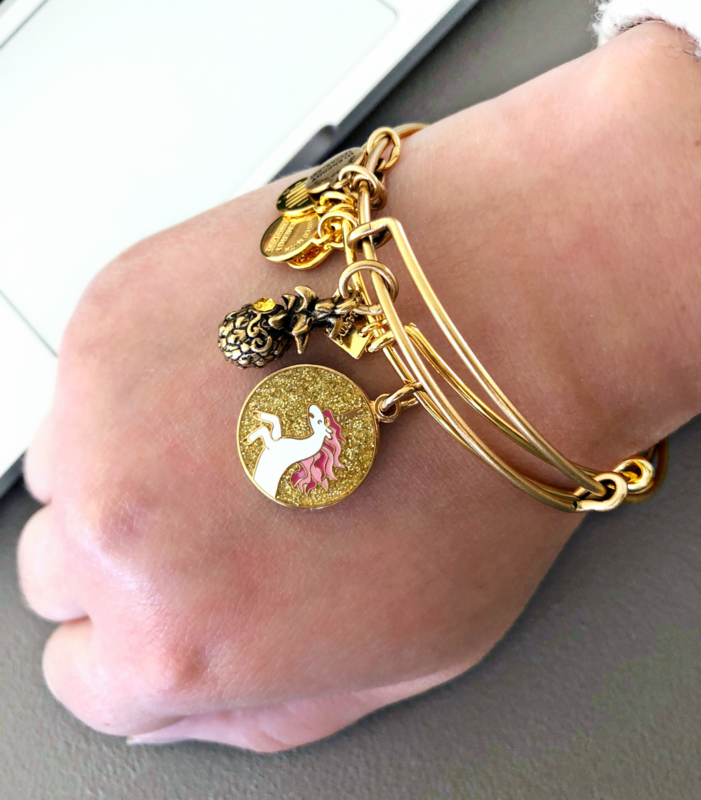 This bracelet is actually part of Alex & Ani’s Charity by Design collection. 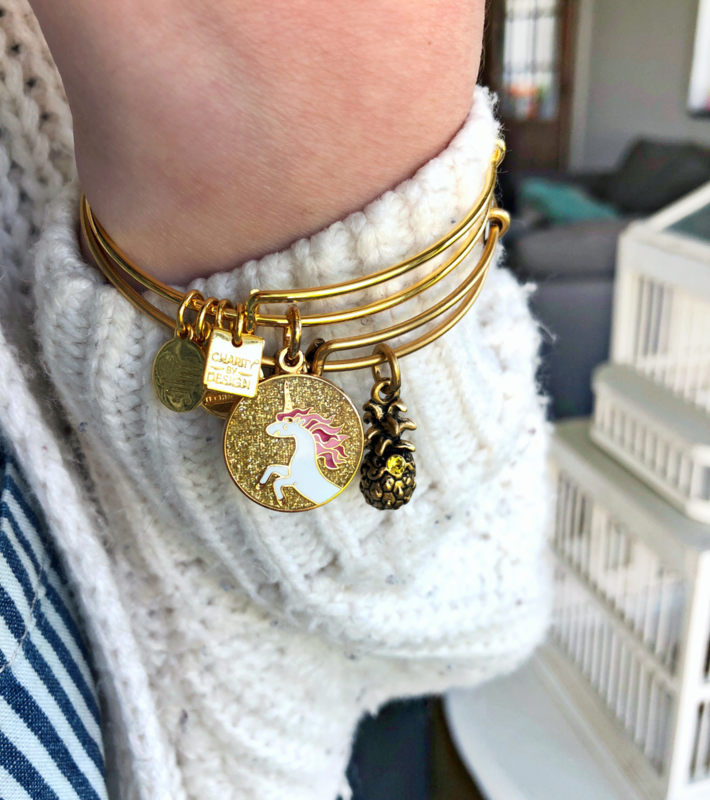 For each unicorn bracelet sold, 20% of the retail price will be donated to the Children’s Miracle Network Hospitals, raising funds and awareness for local children’s hospitals. This is actually my first ever shiny gold finish bracelet I own by Alex & Ani since I usually get the matte silver or matte gold finishes. The shiny gold (or silver) finish is an eco-conscious polished silver and gold plated on a brass base. To protect the piece and maintain its shiny finish, they coated it with anti-tarnish as well. I have to say, I actually really like this shiny finish as well. It’s actually a totally different look if you ask me! These look a little bit more expensive and luxurious. Aside from unicorns, I also have a pretty big pineapple obsession. I love the meaning behind it, I think it looks really pretty to decorate with AND it tastes delicious! 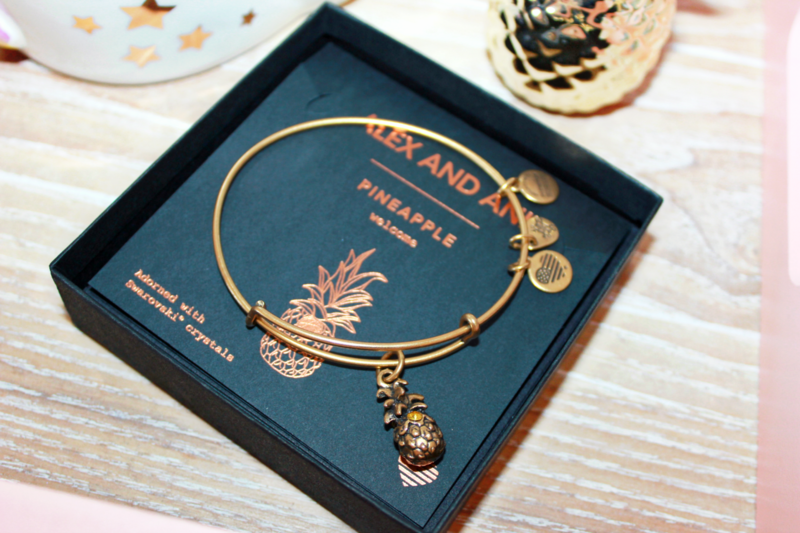 The beautiful pineapple charm is topped with a stunning yellow Swarovski crystal, which adds a really fun (yet subtle) pop of color. This finish is called their Rafaelian gold & silver finish, which apparently is their most popular one. This is again an eco-conscious matte silver or gold plated on a brass base that has gone through an oxidation process. Same as with the previous bangle, it has an anti-tarnish coat to protect the jewelry. I find this finish to stain more easily, which is why you need to clean these more frequently. Also, this may sound weird but I’ve find that these tend to smell like change (as in money) after a while, which I don’t really mind that much but I thought I would mention it anyway! All of the Alex & Ani bangles are adjustable, so whether you have larger or smaller wrists, these should fit you perfectly fine! As you can see, the materials are a bit different in finish and shininess which is why the unicorn bracelet has more of a shine to it then my pineapple one. Luckily, they look really good together and are perfectly combinable! Ever since I picked up my first Alex & Ani bracelet about a year ago (in Disney World Orlando actually), I haven’t been able to stop growing my collection. It’s so much fun creating your stack of bracelets and combining all of their jewelry! These newest additions are so much fun and I can’t wait to create beautiful stacks with them. If you haven’t tried any of their jewelry, I highly recommend looking into it. Be careful though, it’s super addicting! 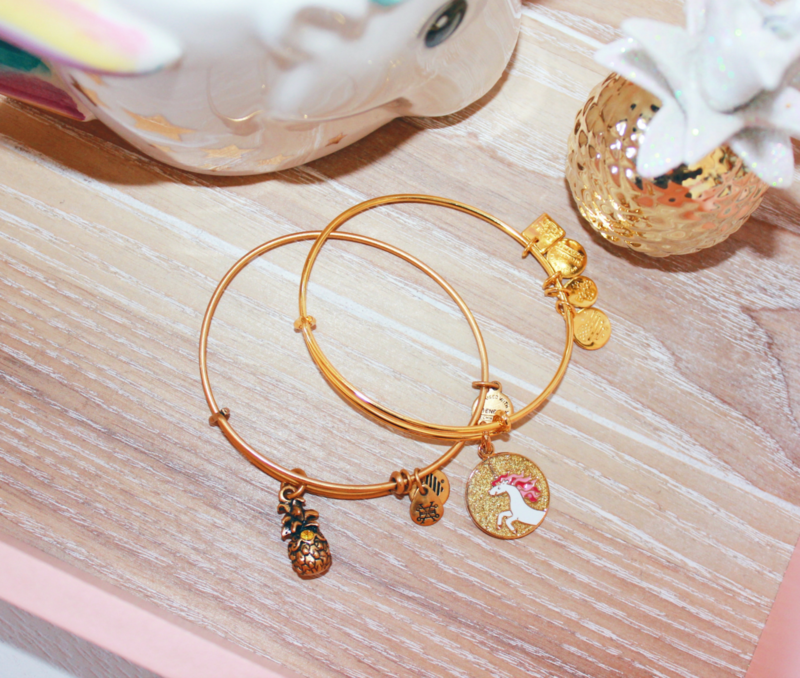 Both the pineapple & unicorn bangles are available at Alex & Ani (in stores & online) for a pretty affordable price if you ask me. Their jewelry ranges from $30 to $150, deepening on the material you get which isn’t super expensive. If you live in Europe, your best bet to get Alex & Ani without paying a ridiculous amount of shipping and customs is to get yours at Hudson’s Bay. They don’t seem to offer the latest designs, but they have a ton to choose from! You do have to take good care of your Alex & Ani jewelry for it to last a long time, so I would definitely recommend you checking out their product care page for tips! Heel leuk! Ben zelf niet zo’n armbanden drager eigenlijk (vind het nogal lastig om dan op m’n laptop te typen enz) maar dit type van Alex & Ani vind ik wel heel erg mooi. Een beetje stoer, maar ook weer niet té 🙂 !